This paper provides a complement to Bond’s submission to DFID on DFID’s future relationship with UK civil society organisations. It takes a broader perspective on civil society support, looking beyond UK-based civil society. 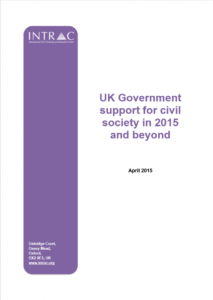 Download UK Government support for civil society in 2015 and beyond. Download Bond’s report: Fast Forward: The Changing Role of UK-based INGOs.